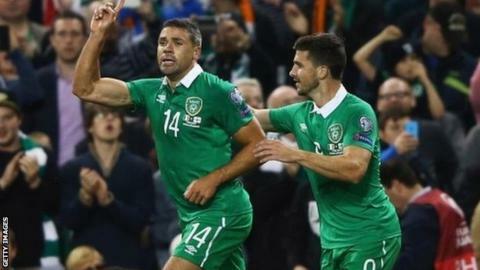 The Republic of Ireland kept their Euro 2016 qualification hopes alive as a second-half goal from Jon Walters earned a vital win over Georgia. After a nervous first-half display, the Republic raised the tempo after the break and Jeff Hendrick's fine run set up Walters's 69th-minute winner. The Republic stay third in Group D but they have a four-point cushion over Scotland after Germany won in Glasgow. Poland remain second after routing Gibraltar 8-1 in Warsaw. What does the Republic's win mean? The Republic are still four points behind group leaders Germany but, with two matches remaining, they are now in position to clinch at least a play-off spot. However, those are two tough games as they first host Germany in Dublin on 8 October before concluding their campaign in Poland. That said, one win would guarantee Martin O'Neill's side one of the eight play-off places. And a win in Warsaw would clinch an automatic qualifying spot for the Irish if Scotland beat Poland in Glasgow three days earlier. The one downside from the Republic's win was the bookings picked up by Glenn Whelan and James McClean, which will rule them out of the Germany contest. Hendrick's stunning run and cross as he jinked past three attempted challenges before setting up Walters to stab home dramatically changed the contest at the Aviva Stadium. The Republic had looked jittery in the first period as Georgia striker Levan Mchedlidze twice went close after being set up by impressive playmaker Tornike Okriashvili. But boosted by the half-time introduction of Shane Long for the ineffective Robbie Keane, the Republic lifted the pace in the second half as the busy Glenn Whelan and Hendrick tested keeper Nukri Revishvili. Yet, the Georgians still looked largely comfortable until Hendrick's bit of magic set up Walters's winner. For that delightful piece of skill alone, the Derby midfielder has to be the man of the match. Despite lifting the pace after half-time, the Republic were still showing little sign of breaking down the Georgia defence until Hendrick's moment of inspiration. Republic of Ireland manager Martin O'Neill: "That was very tense. We didn't play well in the first half. We were very tentative. You might even say nervous. "But in the second half there was a great turnaround, with great effort and application and we found a way to win. Jeff Hendrick was absolutely magnificent for the goal. He has the ability to do that. He just needs a wee bit more encouragement. "And it was great to see Jon Walters, who has had a fantastic tournament for us, get the goal. He's got a great, great heart." Republic of Ireland goalscorer Jon Walters: "It was all about the result tonight. It was tough but we knew it was going to be that. "We managed a 1-0 (win) and we couldn't have asked for any more. Fair play to Jeff Hendrick. He made the goal for me. He's got that ability. He's a top quality player. "We are still a million miles away from qualifying. We've got two big games coming up next months but we'll take that in our stride hopefully." Corner, Republic of Ireland. Conceded by Nukri Revishvili. Attempt saved. James McClean (Republic of Ireland) left footed shot from outside the box is saved in the top centre of the goal. Assisted by Shane Long with a headed pass. Levan Mchedlidze went off injured after Georgia had used all subs. Delay in match Levan Mchedlidze (Georgia) because of an injury. Substitution, Georgia. Levan Kenia replaces Zurab Khizanishvili. Jonathan Walters (Republic of Ireland) wins a free kick on the right wing. Foul by Georgi Navalovski (Georgia). Attempt blocked. Shane Long (Republic of Ireland) left footed shot from very close range is blocked. Assisted by James McClean with a cross. Substitution, Georgia. Mate Tsintsadze replaces Guram Kashia. Giorgi Papunashvili (Georgia) wins a free kick in the defensive half. Substitution, Republic of Ireland. James McClean replaces Wes Hoolahan. Glenn Whelan (Republic of Ireland) is shown the yellow card. Giorgi Papunashvili (Georgia) wins a free kick in the attacking half. Attempt blocked. Jeff Hendrick (Republic of Ireland) right footed shot from outside the box is blocked. Assisted by Jonathan Walters. Goal! Republic of Ireland 1, Georgia 0. Jonathan Walters (Republic of Ireland) right footed shot from very close range to the bottom left corner. Assisted by Jeff Hendrick. Attempt missed. Tornike Okriashvili (Georgia) right footed shot from outside the box is high and wide to the right. Attempt missed. James McCarthy (Republic of Ireland) right footed shot from outside the box misses to the left following a corner. Corner, Republic of Ireland. Conceded by Jaba Kankava. Seamus Coleman (Republic of Ireland) wins a free kick in the defensive half. Substitution, Georgia. Giorgi Papunashvili replaces Valeri Qazaishvili. Attempt missed. James McCarthy (Republic of Ireland) right footed shot from the right side of the box is close, but misses the top right corner. Attempt saved. Jonathan Walters (Republic of Ireland) header from the centre of the box is saved in the bottom right corner. Assisted by Glenn Whelan. Attempt missed. Glenn Whelan (Republic of Ireland) right footed shot from outside the box misses to the right following a corner. Attempt saved. Jeff Hendrick (Republic of Ireland) right footed shot from outside the box is saved in the centre of the goal. Assisted by Glenn Whelan. Foul by Jonathan Walters (Republic of Ireland). Zurab Khizanishvili (Georgia) wins a free kick in the defensive half. Attempt saved. Glenn Whelan (Republic of Ireland) right footed shot from outside the box is saved in the centre of the goal. Jonathan Walters (Republic of Ireland) wins a free kick in the attacking half. Foul by Zurab Khizanishvili (Georgia). Attempt saved. Seamus Coleman (Republic of Ireland) right footed shot from the centre of the box is saved in the centre of the goal. Assisted by Wes Hoolahan.